Each panel in your storyboard can be composed of one or several drawing layers. Those layers are composed together to make the drawing in each panel. By default, a panel contains a background (BG) and a drawing layer (A), but you can add as many layers as you need to each panel in your project. NOTE When adding a layer, you must decide if you need to add a vector layer or a bitmap layer. In most use cases, vector layers are preferable. For more information on layer types and how to choose the right type of layer to add, see About Layer Types. In the Thumbnails or Timeline view, select the panel to which you want to add a new layer. In the Layer panel of the Stage or Camera view, the Layers view or the Thumbnails view, select the layer over which you want to create a new layer. 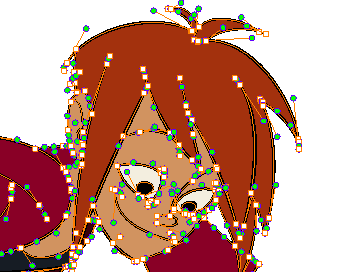 Click on the Add Vector Layer or Add Bitmap Layer button. These buttons are located at the bottom of the Layer panel in the Stage and Camera views, at the bottom of the Layers view and in the Layer toolbar. In the top menu, select Layer > New > Vector Layer or New Bitmap Layer. 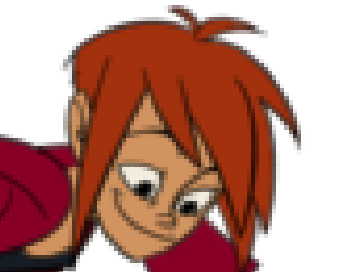 NOTE If you added a bitmap layer, and you intend to scale it up or zoom in on it, make sure to increase its pixel density before you start drawing on it—see Setting the Resolution of Bitmap Layers. You can delete layers that you do not need to avoid cluttering the layer list. In the Layer panel of the Stage or Camera view, the Layers view or the Thumbnails view, select the layer you want to delete. Click on the Delete Selected Layers button. This button is located at the bottom of the Layer panel in the Stage and Camera views, at the bottom of the Layers view and in the Layer toolbar. Right-click the layer and select Delete Layers. In the top menu, select Layer > Delete Layers. You can group your layers together to make them easier to manager, or if you want to transform and animate several layers together. In the Layer panel of the Stage or Camera view or in the Layers view, select at least two layers to group. Click the Group Selected Layers button. This button can be found at the bottom of the Layer panel in the Stage or Camera view and at the bottom of the Layers view. Right-click on the selection, then select Group Selected Layers. 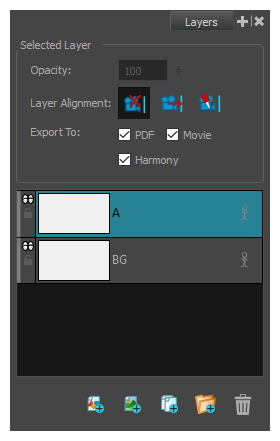 In the top menu, select Layer > Group Selected Layers. TIP You can drag and drop layers into or out of groups. When working with many layers, you can temporarily hide certain layers to avoid cluttering the stage. You can also hide a group. When a group is hidden, all of the layers it contains appear hidden, but their individual visibility state is preserved. Therefore, if you hide only some layers inside a group, hide the group itself, then unhide the group, the layers that were individually hidden will remain hidden and the ones that were visible will be visible again. In the Layer panel or the Layers view, click the Show/Hide Layer icon just left of the layer. In the Thumbnails view, click on the Show/Hide Layer icon just beneath the layer's name. In the Layer panel, the Layers view or the Thumbnails view, select the layer, then select Layer > Show/Hide Layers from the top menu. You can lock a selected layer to protect any objects on it from being changed. Once locked, you can unlock the layer to make changes to any objects on it. In the Layer panel or the Layers view, click the Lock/Unlock icon just left of the layer. In the Thumbnails view, click on the Lock/Unlock icon just beneath the layer's name. Then, select Layer > Lock/Unlock Layers from the top menu. In the Layer toolbar, click on the Lock/Unlock Layers button.